There's nothing we like more than a fine mix of fashion, estate jewelry, curiosities and festive spirits. Please join us for two special holiday events, we'd love to see you! We're popping up in the Podolls' brand new flagship store in Burligame. If you haven't been, it's a must-see! 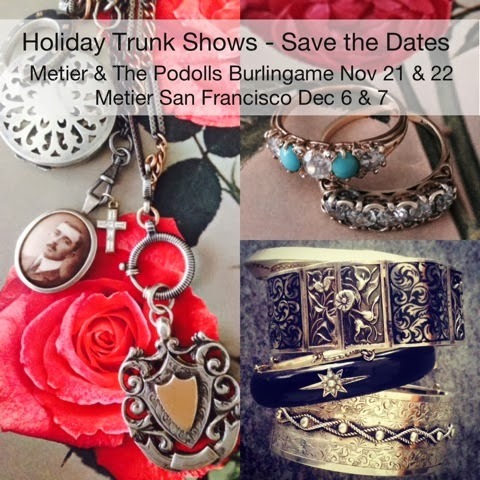 We will be featuring a curated group of Estate Jewelry, hand picked with the Podolls' modern-girl look in mind. Read about the Podolls and their beautiful store here. All day Friday, November 22nd, 11-6pm. We are hosting an exclusive show with just-back from Europe antique treasures and collectables, one-of-kind and new pieces from Conroy & Wilcox, Ariel Clute, vintage finds, hand knits and much more. Details to come, stay tuned. Friday, December 6th, 12-7pm. Cocktails and raffle, 5-7pm.